Orthography: Romanized Japanese when here printed in italic type serves as a phonetic transcription to indicate the actual pronunciation of written Japanese. Some names and words of Japanese origin have been adopted into English with spellings which may no longer be phonetically accurate. Written as English these forms appear here in normal type (for example, Rakusan as opposed to 楽山, Rakuzan). For typing convenience Rakusan's writings in the traditional Japanese scripts have been retranscribed here to read from left to right. Because Rakusan used older kanji variants, modern transcriptions have been included where necessary to conform to current Japanese usage. Names clarifications: As with English proper names, Japanese names may be written and pronounced differently from what might be expected. Therefore in either language it is not always possible to guess the spelling from the pronunciation (or vice versa). According to the artist himself, the proper spelling of his art name in Western style is "Rakusan" (with "s"). When including his family name in similar circumstances, he placed it after his art name in Western fashion, "Rakusan Tsuchiya". When writing in Japanese, if Rakusan included his family name, he placed it before his art name according to normal Japanese usage, 土屋楽山, Tsuchiya Rakuzan. 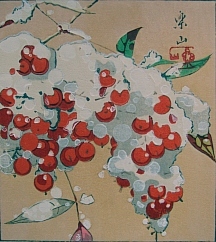 Rakusan was born 土屋浩三, Tsuchiya Kouzou, and during his early studio years he used that name in his role as a printer/publisher or producer/distributor. (Note that Rakusan's correct birth date is 25 April 1896; reports of a birth date in "1886" are the result of a published typographical error.) The other name variations are all art names (號, gou), used by themselves or in combinations as signatures and seals on artworks and on colophons. For seven years (1913-1920) Rakusan was apprenticed to the great Kyoto artist 竹内栖鳳, Takeuchi Seihou, (1864-1942), usually called "Seiho". Rakusan artworks show many parallels to works by his master as well as to those of other contemporary Seiho students. The Rakusan Archive Project: The Rakusan Archive Project is a non-profit organization whose goal is to provide information to the public about Rakusan Tsuchiya and his artworks. In order to accomplish this, a permanent study archive of materials is being assembled and endowed, and a major book is in preparation which will eventually accompany a comprehensive catalogue of Rakusan artworks. Currently, the Rakusan.net website (linked also from Rakusan.org, and Rakuzan.org) includes only a small selection of the material already assembled. The website offers reference information only, and none of the artworks are for sale. The Rakusan Archive Project is ongoing, and anyone with detailed questions regarding information not yet posted here, or with additional documentary material to offer, is encouraged to contact us. As new information is obtained, the existing entries will be updated and corrected as required. Some detail expansions of particular sub-pages are still in progress, and several sections of the website remain under construction.